Any questions, please email membership@spra.co.uk. Details about the job vacancy Based from home, this role offers an exciting and challenging opportunity to provide strategic direction and deliver the objectives of the Institute as reviewed and agreed with the Board of Directors. Making high-level decisions about policy and strategy. Keeping the Board of Directors informed about policy issues. Providing executive leadership across the Institute. Developing and implementing operational policies. Acting as the primary spokesperson for the organisation. Developing the organisations culture and vision. Develop an organisational environment that promotes positive morale and performance. Where necessary, challenge current performance levels. Guiding the Institute through periods of growth. Solidifying the Institute’s position in the marketplace. Giving a clear sense of purpose to the Institute, its Regional teams and its members. Profit and loss, balance sheet and cash flow management. Influencing, consensus building, and sustaining relationships. Ability to get up to speed quickly on new issues and to make sound judgements on them. Having a can-do, problem-solving attitude. Ability to plan own workload effectively and to delegate. 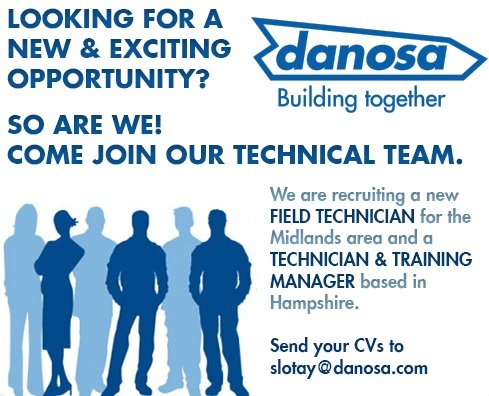 Job title Field Technician, Midlands area and a Technician and Training Manager based in Hampshire. The Construction Products Association represents the UK’s manufacturers and distributors of construction products and materials. Nearly 80% of all the products used in the UK are made in the UK. The sector directly provides jobs for 337,000 people across 24,000 companies and has an annual turnover of more than £60 billion. The CPA is the leading voice to promote and campaign for this vital UK industry. Job details The Construction Products Association is looking to increase its technical capacity and develop its strategic interest in digitalisation. As such, the CPA is seeking to appoint a Technical Manager to support the delivery of its work in this area. With a number of projects, including those around LEXiCON and Digital Object Indicators, reaching delivery phase, the Association is looking for the right candidate to join its energetic and highly motivated team. The position holder will work on a range of construction sector topics relating to digitisation that are widely anticipated by our members, and be responsible for liaising with industry and Government in equal measure. Job ObjectivesEnsure that the regulatory framework, standards, sustainability policies, and industry improvement initiatives, which affect the construction products sector, will incentivise and support the development of an innovative, growing and profitable construction products industry. To help establish a legislative, regulatory and standards framework that allows the industry to be competitive. To work with the members to promote a culture of product and process innovation geared to improving the performance of the construction industry. To ensure that product manufacturers and suppliers have a key role in delivering a digitally enabled and more sustainable built environment. Key Priorities in Support of Job Objectives:Legislative and Regulatory Framework – Ensure early awareness of relevant regulation/legislation at both domestic and relevant overseas levels – particularly in building regulations, product regulations, technical innovation, health and safety and consumer protection. Develop industry-wide positions on such proposals and influence decisions by relevant authorities; e.g., UK Government, Devolved Powers, European Commission, etc. Work to achieve appropriate implementation of legislation, policies and raise awareness of the implications for the industry. Ensure the Association have effective Technical Committees and other working groups in specialist areas, such as competence. Support the Senior Technical Manager in ensuring there is effective industry input to bodies such as BSI, BBA, CP Europe and wherever else the industry needs to be represented, undertaking this representation whenever it is necessary or appropriate. Ensure, with the Senior Technical Manager, the Association is fully involved in the review of the process for developing the new regulatory framework and building regulations. 2. Product and Process Innovation – Work with members and project partners to support the development of a digitally enabled construction supply chain.Support other CPA staff on product innovation particularly their relationships with national funding bodies, Government departments and other relevant bodies. 3. Delivering a more sustainable built environment (in co-operation with Environment Policy Advisor)Support the Technical Team in developing with others a programme for delivering zero carbon new housing. Work with others in the Association to persuade Government to adopt more effective measures for improving the energy efficiency of the existing building stock. Our company name has been synonymous with delivering dependable waterproofing solutions backed by supreme levels of customer service. This hard earned reputation has been built on a foundation of quality and on ethos of customer service which permeates through the organisation and remains as strong today as it did 100 years ago. Job details We are currently recruiting for an experienced Technical Manager to manage the position of technical support for IKO Polymeric Products.